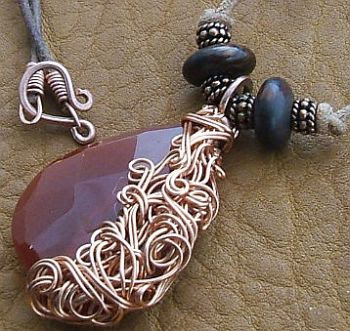 Texas based Szarka (Dianne) Carter is an accomplished wire artisan with a serious gemstone addiction. She has been making jewelry for over 20 years with 10 of those buying and selling the gemstones as well. And she is back with another fabulous gemstone giveaway! I have featured some of her designs before. Shown here are my favorites from her finished jewelry store which is simply called Szarka's. A couple of her more recent designs include her free spirited chaos - sometimes named Kaos - inspired ones. Check her Flickr photostream for even more photos! One simple design which caught my eye was her Carnelian earrings because of its bold look and the integration with the ear wire. Szarka also has a free tutorial page which lists not just her tutorials but by other people too . Her wire wrapped Bingo Ring tutorial is a lot of fun! Her wholesale store Magpie Gemstones is filled with quality hand picked gemstones and they are all 20% off at the moment because she is celebrating a new website design. The gemstones are at very competitive prices because this small family owned business employs a direct sales model. This effectively eliminates the middleman. Buyers thus "receive 40-50% savings over standard industry retail pricing without membership or faux wholesale gimmicks, and up to 30% off additionally." What I also noticed is the free shipping for orders over $39 for both US and Canadian buyers! Shipping costs is always tricky crossing the border for us Canucks so that is a sweet deal indeed. Szarka has generously offered a $50 gift certificate to one lucky winner of this giveaway. If you wish to try your luck, please make a comment below. Make sure you leave contact info if you do not have an online shop or blog. It ends in a week's time at 6 pm EST Monday, July 23, 2012. I will pick a winner randomly and announce the results as soon as possible after. So be sure to leave a contact email if you don't have an online link or make sure you come back and check! Otherwise I will redraw in a week. Good luck! I follow Szarka and her work. Have loved her Kaos designs--what talent! And her gems are top rated, great customer service! Hi!! Great give away. Thanks for the opportunity to enter! Awesome giveaway. Thanks for the opportunity to enter. Thank you for passing along this opportunity. Szarka's 'Magpie Gemstones' are indeed the very best buy in stones. Please count me in to the giveaway! This is awesome! I'm going to need a ton of cabs for school in a few months, so winning this giveaway would be great. I would seriously love to win this one, but in the meantime, just happy to look at Szarka's creations and the shop. Thanks for this opportunity!I love her designs! I am a blog subscriber and a facebook fan! Dianne has such a beautiful unique style - so elegant. Thank you for all the inspirations & generous opportunities you share. Ooh - Those are so pretty! I'd love to have those earrings! Thanks for a really great giveaway! It is a real treat to view genuine creativity. To be able to purchase qualitity gemstones from the same artist is a unique privilege as well. I hope I win! I love you and Szarka. I am a blog subscriber and promise to go to your Facebook Fan page next. I would love to win the certificate because all the stones, etc, I buy from Szarka are excellent. Both of you ladies are so generous, sharing you knowledge and expertise with all of us lucky subscribers! Thanks. Wow. I am going to wish everyday that winner will be me. This is a wonderful giveaway. I regularly am lured into Szarka's Magpie shop...she has such great items and great prices also. I follow her on facebook, get her emails and I also follow your Beading Gem's Journal blog daily, your facebook page and twitter feed. Thank you for this opportunity to hopefully get more of Szarka's goodies...love that inlaid heart in your blog post. Szarzka's pieces are gorgeous! And I am going to check out her website and photos! Her pieces show off her skill and creativity. I would love to win please contact me cmathieu_2000@yahoo.com. Her work is exceptional and very unique. Love it. Count me in. Will have to check out her website to see more of her fantastic pieces. I am a fan - follower or Liked you on Facebook. Love Szarka's jewelry and her website. In fact am waiting for an order that I placed over the weekend. She has very nice stones and good knowledge. Would love to win. Gorgeous designs, and love the tourmaline! Thank you for the generous giveaway! What a way to start a Monday! Of course, I'd love to win, but Ms Szarka is a fabulous artist to discover. Thank you for showcasing her work. Love your blog and Szarka's work. I would love to win the sweepstakes so I can purchase more "toys" to play with! I am a full-time hospital secretary with a family business on the side. I make and sell handmade jewelry and other items with my Mom and sister. We have a show at least one day a week at our local health centers. Keep the beautiful inspirations coming!! I will be coming back to check your blog! I keep a weekly update about our business on Facebook under Gilbert's Crafts. Pick me! Pick me! I love Szarka and her work and also she sells good stones. Seriously can't get much better than Magpie. Love Szarka! I have bought stones from her before, and they're very good quality. Such gorgeous work, would love to win this contest! Long time Szarka admirer & Magpie Gemstones customer. Would love to win a gemstone shopping spree! Thanks to both of you for the opportunity to win! She does have the most awesome things! Love (& following!) Szarka & Magpie Gemstones :-) and would love to be entered in this spectacular giveaway! Hello - Am a subscriber to the newsletter & LOVE Szarka's creative works! Gorgeous! Great Giveaway! Love her work and her FB page. She is so willing to help others! Love her website and Facebook page. Thanks for the giveaway-- it's fun to dream of what you can get if you win!!! Beatiful work, beautiful beads and a giveaway. How wonderful. Thank you. I follow Magpie gems on Facebook. I love the look of her jewelry. I am still learning wire wrapping and I hope to get to that level. She's a great inspiration. yes, please enter me in this great give away. Just subscribed to her Magpie newsletter. How did I miss her? Such great work. Great giveaway. Thanks so much for this opportunity. Oh I love Szarka's store! Please enter me in the drawing. I love Szarka's work-very unique. Her turorials are good also. I am a follower of yours now. I love these gems and ideas! Szarka is an amazing wire artist, I would love to intern with her and learn the artistry that is her! I love her beads. Hers is one of the very few online shops that I'll buy stones from. I know, without a doubt, that I'll get quality stones at an amazing price. She's truly a class act. I have been a szarka fan for *years. * She has a special artistic flair that sometimes even takes my breath away. I would be very honored to receive a gift certificate. I want it!!! I'd love to win, love her stuff. What a great giveaway to a great store. Love the carnelian earrings, so stylish. What a gorgeous "Give Away"!!! She is the best!! Hi- thank you for this opportunity. While I am new to your blog, I am not new to MagpieGemstones and Szarka's creativity. I am a beginner designer/learner and so appreciate tips and tutorials from you both. I am already a contributor to her FB page where I find lots of info.Thanks to you both. Super give away! Thank you so much for the opportunity! Would SQUEEE with excitement to will this generous gift certificate! I never win these things - but it never stops me from trying. And I love Szarka's gems and designs. Can't wait to shop her new website! Szarka is not only makes awesome jewelry, she is an awesome person. She is always honest and goes out of her way to help those of us who are just starting out. Oops, I forgot to link my facebook pages. just started a silversmithing class at my local college. i have seen so many beautiful pieces of jewelry that i would love to be able to make. this is step one!! This is a great giveaway! Thanks for the opportunity to enter it! Szarka's beads are wonderful, and she has "not the ordinary" as well. Her customer service cannot be beat! I have bought beautiful things from Szarka in the past and thank you for having an international competition. We're a little forgotten way down here in Australia. I love the gems from Turquoise Magpie,love the tips from Szarka, and would really love a gift certificate for her gemstones. They are the BEST, and so is she! Thank you for the opportunity. I'd love to win this certificate and am already thinking what I could get with it! Thank you for this opportunity! I am an avid follower of Szarka. I love Szarka's gemstones, tutorials, and her work. This giveaway is wonderful! I will pass the word on facebook and subscribe to your blog. Thanks for this offer. I LOVE her website, thanks for offering the giveaway!! What a great giveaway - thanks for letting me enter. Love Szarka's work! Szarka is truly the Goddess of Wire-Wrapping. Watch her how-to videos carefully and you will discover tons of secrets! I make cat jewelry and I've gotten some gorgeous gemstone carved cats from Szarka. I'm always looking for more cat beads! Thank you for this very generous offer ! 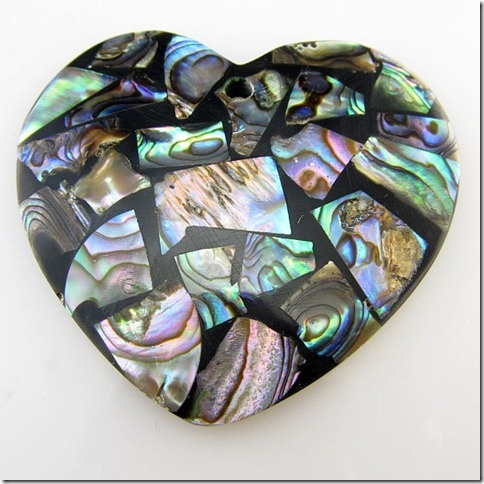 Love Szarka and look forward to seeing her at local bead shows. I would totally love to win a gift certificate from Szarka!! Love Magpie Gemstones. I purchase from them frequently. Szarka is truly an accomplished artist! I love looking at her finished jewelry. As a very unaccomplished jewelry maker (I am learning, just have a long way to go) I love using her beads. I am never unhappy with her beads and they are priced so that I can afford good stones. Thank you for a caring and honest company to purchase from. Szarka is an awesome artist. I love buying her beads. Thay are always beautiful and the company is honest and caring at all times. Thanks for the opportunity - Szarka's stock and work is fantastic! Love Dianne's designs, she is a very a talented artist AND based in my home Stat of TEXAS!!! 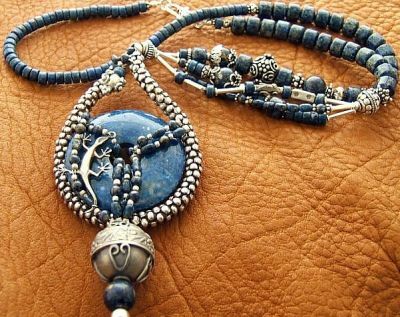 The Lapis Lazuli has to be my favorite design - gotta love the lizard!!! LOVE Magpie Gemstones and just placed two separate orders in the past few days...copper beads and toggles today! I hadn't seen her "How to Crimp Securely for Heavy Jewelry", so thanks to you both! LOVE Magpie Gemstones. I have placed two orders in the past few days. Today, the order was for some copper beads and toggles. I also just read the "How to Crimp Securely for Heavy Jewelry", so thanks to you both! I would like to enter for Magpie certificate. She gets me all the time when she has you email for code on limited items. And then, of course, I have to buy enough for free shipping. LOL. I love all her stuff, such high quality. Mmmmm....gift certificate,who wouldn't love that opportunity! Thanks! Ooh I'm a stone addict, how exciting! I would love a chance to win this giveaway. Thanks. Love the designs as well as the stones. Great talent and creativity. I became a follower and thought I made that comment, but I don't see it, so I'm making sure it's here for another chance ! THANK YOU !! I pinned your blog and giveaway to my board called Jewels ! Need more beads from Szarka ! I love Szarka's beautiful designs and I have to toot my horn as she is from the GREAT State of TEXAS - as am I!!! Praying that I will win!!! Thank you for such wonderful giveaways. Such beautiful things! I would love to be entered in this. Thanks so much for this opportunity! I would love to be entered for the GC. She has such beautiful things. Thank you very much! I posted a comment earlier today but it didn't appear. I'll try again. This giveaway is awesome. I am already a follower and will post on facebook. Love Magpie! Always have a wish list! !!!! I love Magpie! Thanks for the chance to win. I am a blog subscriber and would love to win this giveaway.
. I shared this contest and blog on Pinterest with the closing date included. OOOOh, that tourmaline is delicious. I might have to check out the new website. What a generous and amazing opportunity. Who wouldnt love beads and the tutorial. I love working with beads and wire and would be honored. Thanks for the wonderful gift you gave to one lucky winner. :) Happy sales and creating to you. Your Jewelery designs are stunning and so unique! The gemstones are j=harder for me to work with but you make it look so easy! And thanks Gem, for a great giveaway! I love your stones, thanks for the chance in your drawing! I only discovered Magpie a short time ago but I've already ordered and love her gems and findings. Thanks for making your giveaway open to everyone! Liked you on FB and added to G+, but I think this quite enough entries for one person!! Wow,Szarka's wwork is great! What a fantastic giveaway! What a fabulous offer! Thank you so much for the chance to win. Szarka's gemstones are top notch and I am always happy and pleased with what I get from her store. Please enter me too!! What beautiful beads! Wow, what beautiful beads and truly original wire wrapping this lady does, something to aspire to. Thanks for the giveaway! I have always loved your work - I wish me luck! I've always loved you work and your beads - wish me luck! I have bought from Szarka for quite a while and love the quality of her gemstones. I would like to be entered in the drawing. Thank you. Enter me in the giveaway. Great pieces. Thanks for the opportunity. Facebook fan and subscriber. Love these pieces. They're remarkable in all ways. She's obviously very talented. I already follow the blog (theirs and yours). Thanks, Pearl. I'd love to win this one! I love all the pretties at Magpie Gemstones and I receive my orders the next day - can't top that !!! What an awesome display on this page. I fell in love with the necklace as soon as I saw it. Gorgeous. They have amazing quality supplies!! Great giveaway! She has beautiful supplies! I'm not sure if accomplished quite covers that wire work! Amazing! Great pieces and very creative! I follow Szarka and her work. I absolutely love her creations! I would love to be entered for this drawing! Love your blog too!! it's great! Would love the chance at a gift certificate for Magpie! Thanks for the 0pportunity! This is a wonderful giveaway! I'm always on the lookout for great gemstones. what a wonderful giveaway! I'm always on the lookout for great gemstones. I would LOVE too win the $50 gift certificate. Thank you Magpie Gemstones for the awesome giveaway. I love the tutorials! Thanks for the chance to win some beads! Love 'Magpie Gemstones', I look forward to reading their emails every day :) Thanks for the opportunity. I am so happy to have found your shop. Thank you for offering an entry to win a gift certificate to your shop! Szarka has the best looking beads around, I would love to win a gift certificate!! I tweeted your blog post! I'm a blog subscriber/follower and I follow you on FB. Magpie Gemstones is my #1 favorite store fore buying precious gems. Not only are the prices great, the owner, Szarka, has to be the most generous & giving store owner out there - sharing her original designs when people ask … where else do you find that? The beautiful products, great prices, honest appraisal of the quality, vibrant community w/TONS of tutorials & galleries, and the new & updated website all make it the best gemstone store, jewelry makers delight bar none!